This week’s 5 Fandom Friday is “5 Favorite Fictional Foods“. Let’s see if we can even find 5 items of fictional food that we would like to try… most foods in fictional universes aren’t all that fictional. We haven’t gotten around to making our own Lembas bread, but it’s on the list of things we want to do in our lives. In the movies, it looks like toast, but since it’s a lot more than that, we’ve always been really curious about it. Just too lazy to actually go and make it so we can eat it. It’s not technically food, but we put it on here anyway. Because who isn’t curious about Butterbeer? The concept kind of always sounded disgusting to me, but because everyone in Harry Potter seems to love that stuff, we really want to try, too. 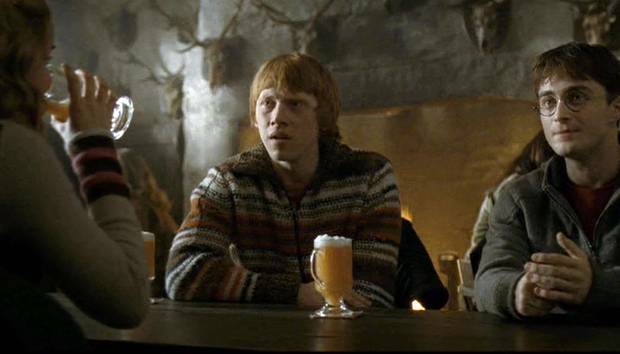 We’d totally love to have a Butterbeer at the Wizarding World of Harry Potter, but that’s not really an option… I guess that’s one more item on our bucket-list that’s gonna stay there for a while. I have actually tried those, in Las Vegas, on Holidays. We made a challenge out of it, my siblings and I, and it was disgusting. But awesome! We always loved the idea of the Every Flavour Beans, because it’s disgusting. Wizards must be nuts to actually want to eat sweets that may or may not taste like vomit, black pepper, or ear wax. I bought some at King’s Cross, but they did not taste like what I would have expected. Anyway, it’s not about the frogs, is it? It’s about the cards. And those are, although not nearly as cool as they were in the books, still pretty cool in real life. It’s also nice that wizards also enjoy normal sweets, and normal chocolate, without any weird tasting beans. Who has not wanted to try that after watching/reading Narnia? I mean, is it really sell-your-family-out-to-the-evil-queen-good? I want to know! I’ve had it a couple times before, and it’s actually pretty good. Kind of a gummy candy with a sticky texture and flavor more like jelly, coated in powdered sugar, and sometimes containing nuts.